You can earn 500 yards with this purchase! Get your golf handheld and golf radar in a single unit with the Garmin Approach G80. 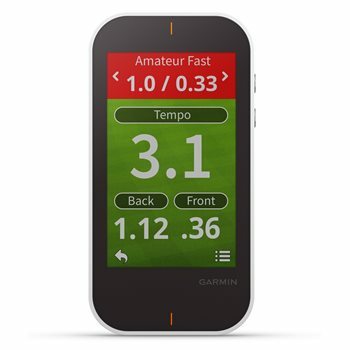 G80, an all-in-one GPS golf handheld with integrated launch monitor, features radar technology. This technology makes it easy to track club head speed, ball speed, smash factor, swing tempo and estimated distance. Additional features include the PlaysLike Distance feature that provides distances to the target, adjusted for uphill or downhill shots; PinPointer, which shows the green’s location on blind shots; and Touch Targeting that allows you to touch any point on the display for precise distance to that spot. G80 is equipped with multiple different practice and game modes. Play virtual rounds on any of the more than 41,000 preloaded courses worldwide. Develop accuracy and consistency with target practice. It helps you focus on drives, short game or your overall game. Approach G80 works with the free Garmin Golf app, which lets you compete, compare and connect with fellow golfers.